September is Hispanic Heritage Month in the United States. 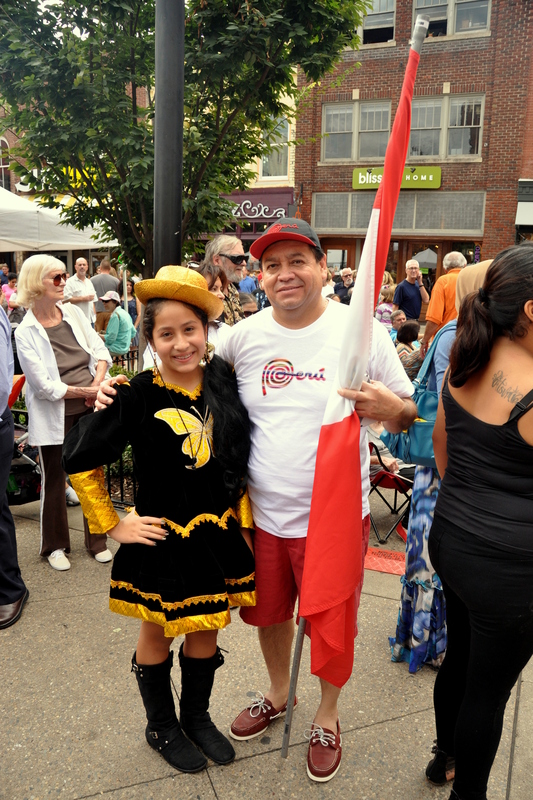 Two weeks ago I attend “HoLa Festival,” Knoxville’s annual celebration of the food, music, and culture of Latin America. 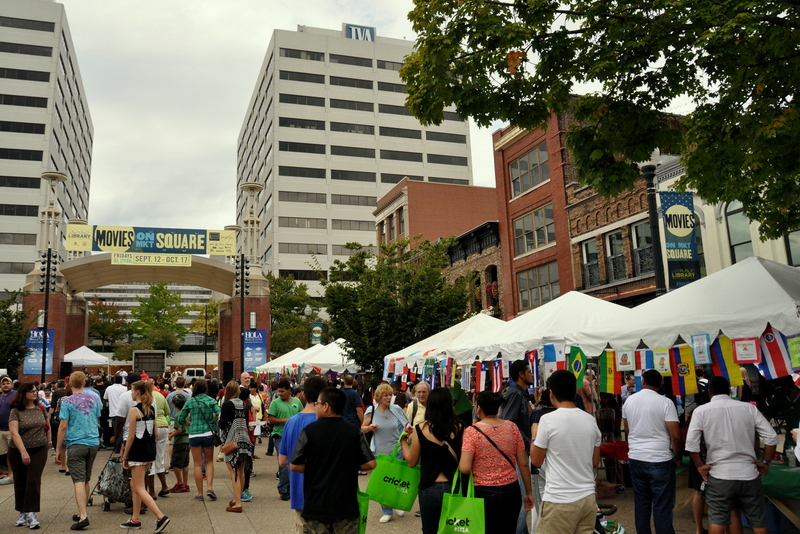 For two days each fall, Market Square and adjacent Krutch Park are transformed into pedestrian malls with kiosks and booths selling food, drinks, arts, and crafts from various Latin nations, including Spain and the Caribbean. My mom joined me for the day. She was most interested in seeing the costumes and watching the “Parade of Nations;” I was most interested in tasting the food. Krutch Park is a small green space in downtown Knoxville dotted with modernist sculptures and park benches. Market Street, which runs along the west side of the park, was closed to vehicles and turned into an open-air food carnival, similar to the Taste of Chicago and other venues that I am familiar with. Two drinks tents operated on a ticket system – one sold bottled water and soft drinks, while the other sold cervezas y margaritas! We canvassed the street before deciding on Salvadorean food. I had a pupusa and two taquitos, while my mom had a pork tamal and one taquito. If you’re wondering what those are (I didn’t photograph our plates, unfortunately), pupusas are thick flour tortillas filled with beans and cheese and – in this case – topped with El Salvador’s version of cole slaw. Taquitos are corn tortillas that are rolled, stuffed with chicken, and deep fried, then topped with lettuce and shredded Manchego cheese. They are common street food in Mexico as well as in El Salvador, although their Mexican equivalents are usually called “flautas” (flutes). A tamal is often misspelled in the U.S. as “tamale” (the “-e” is added to the plural form of the word). By any spelling, it is a sort of corn meal, ancho chile, and chicken or pork hybrid baked into a steamed corn husk or banana leaf. Food prices were reasonable, and the event drew considerable crowds. (Acording to the official website, over 30,000 people attended this year’s HoLa Festival.) Two booths served Mexican food – tamales, tacos, rice and beans. A Puerto Rican booth served fried seafood fritters. A Jamaican booth served jerk chicken that looked incredible. 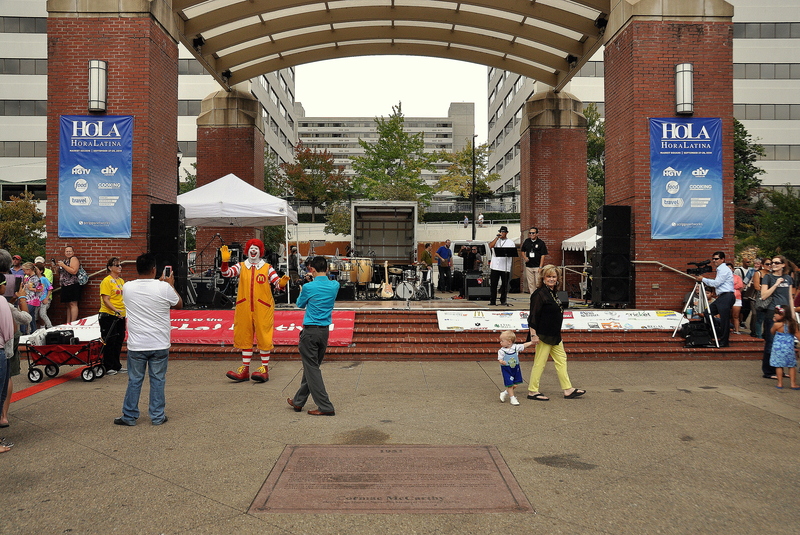 Peruvian, Bolivian, Colombian, and Argentinean food vendors were among the others represented at the festival. The U.S. has strict agriculture laws and customs laws, so the more exotic dishes (Mexico’s fried grasshoppers, Colombia’s fat-bottomed ants, Peru’s alpaca, etc.) were nowhere to be found, but I still could have eaten satisfactorily at any country’s tent. My mom was also satisfied with her meal. I made a mental note to grab some Jamaican-style jerk chicken later, and we proceeded towards Market Square. 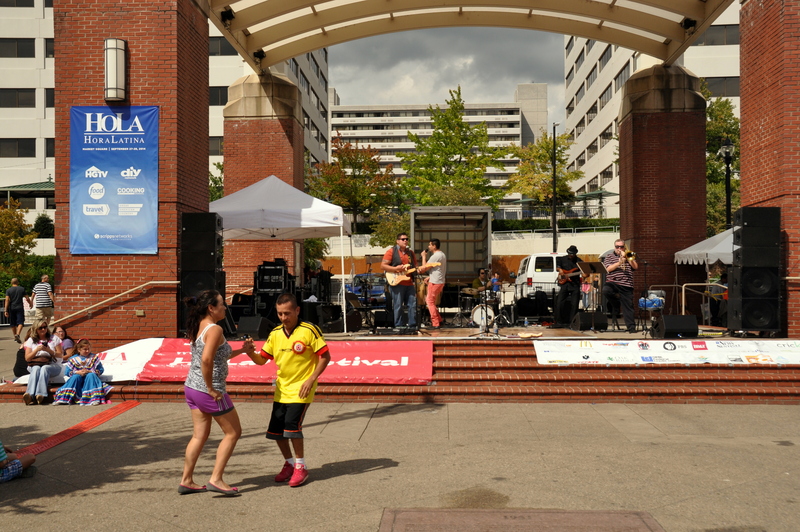 “The Square,” as it is often called, is a year-round hive of festival activity in Knoxville. A bandstand regularly plays host to free concerts, the east and west flanks of the square are lined with pseudo-turn-of-the-century buildings, each housing a restaurant of some sort. Ice skating is offered for several weeks leading up to Christmas and New Year’s. The entire Square is even listed on the National Register of Historic Places, although the market hall of the title actually burned to the ground in 1960. Latinos, whether American-born or foreign-born, seldom win points for punctuality, although when they arrive, they arrive with style. As such, the “main event” – the Parade of Nations – started late but did not disappoint. Several countries were featured, and their costumed representatives paraded past the stage and waved flags as cameras flashed and spectators cheered. The U.S. was first – and had the largest delegation (including Ronald McDonald himself) – but the representatives for the other countries were more lavishly dressed. Mexico, Guatemala, Honduras, El Salvador, Cuba, Haiti, Jamaica, Puerto Rico (which elicited the greatest applause), Panama, Peru, Bolivia, Brazil, Argentina…and Spain. Above pic: Craft booths in historic Market Square. 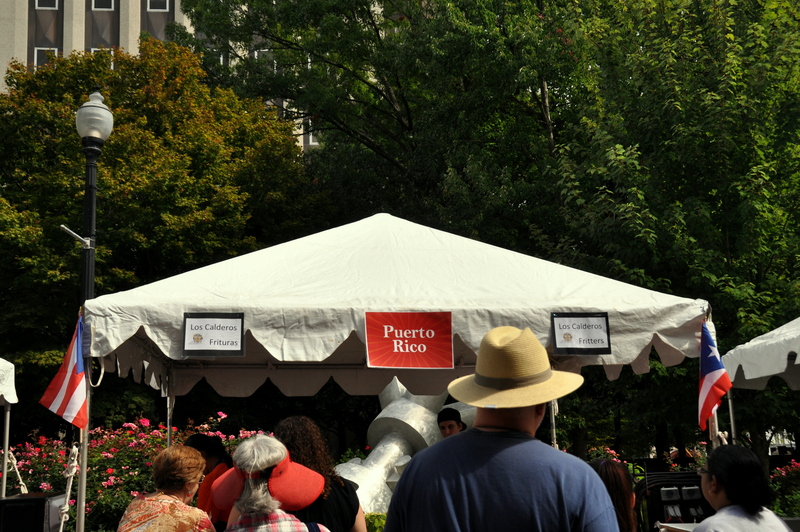 Below pic: Puerto Rican food tent and customers on Market Street. Above pic: Salsa dancers in front of the Market Square bandstand. Below pic: Ronald McDonald (a Latino?!) representing the U.S. during the Parade of Nations. 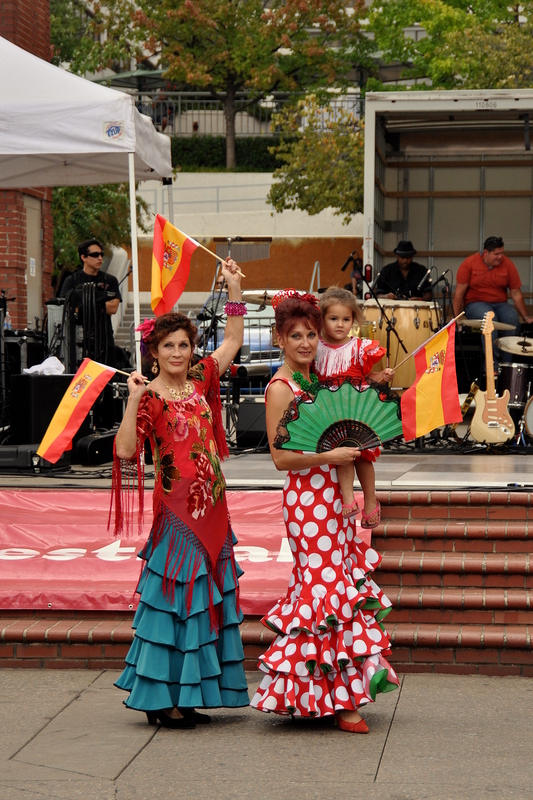 Above pic: Flag-waving, costumed representatives from España (Spain). 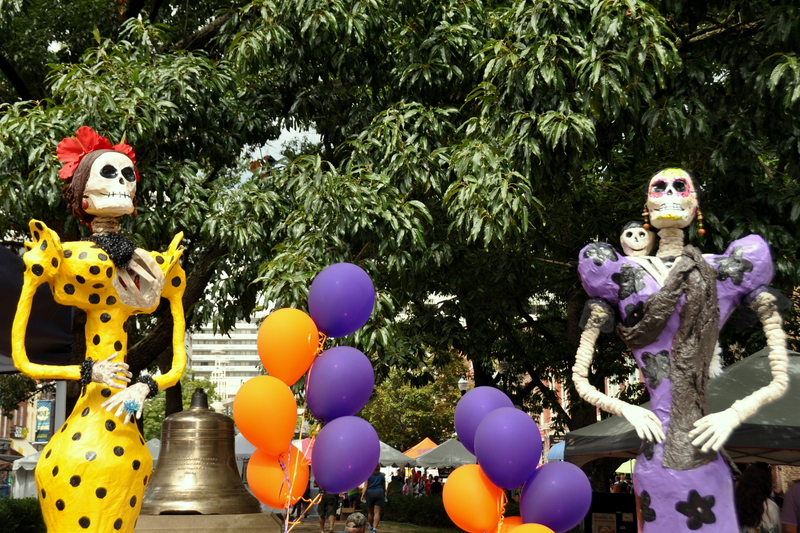 Above pic: Papier mâché Día de Muertos (Day of the Dead) figures from Mexico. Below pic: Proud Peruvian father and daughter. I suppose that “tamale” is the accepted American spelling, but technically – and in Latin America for certain – “tamal” is singular and “tamales” is (are) plural. I still say it incorrectly myself sometimes. Thanks for commenting! Thanks for the etymology lesson. Mexican Spanish – and Spanish from northern Central America, such as El Salvador – is especially fascinating because of the added “color” brought to the vocabulary by the Aztecs, Mayans, etc.